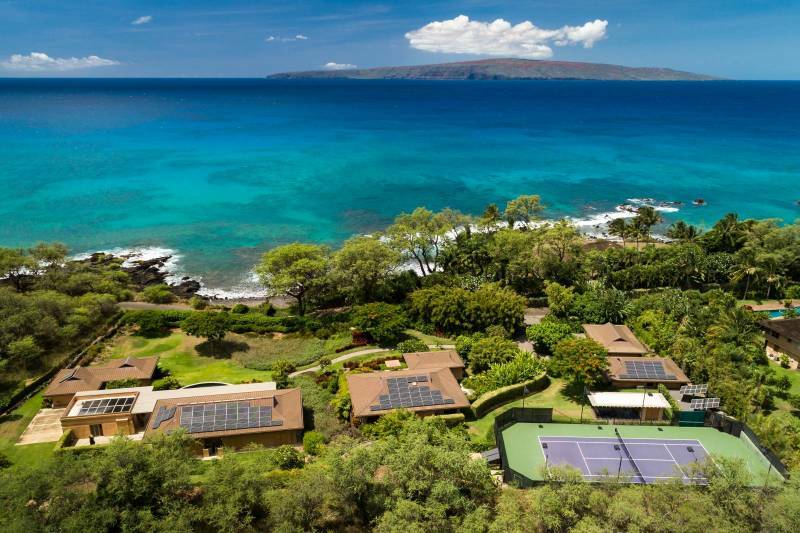 This ultra-luxurious Makena estate has all the trappings: mesmerizing coastal views, spectacular greenery, a sparkling infinity pool, 25-meter lap pool, outdoor hot tub, zen garden, and tennis court. But its most distinctive feature? An all-encompassing sense of calm. 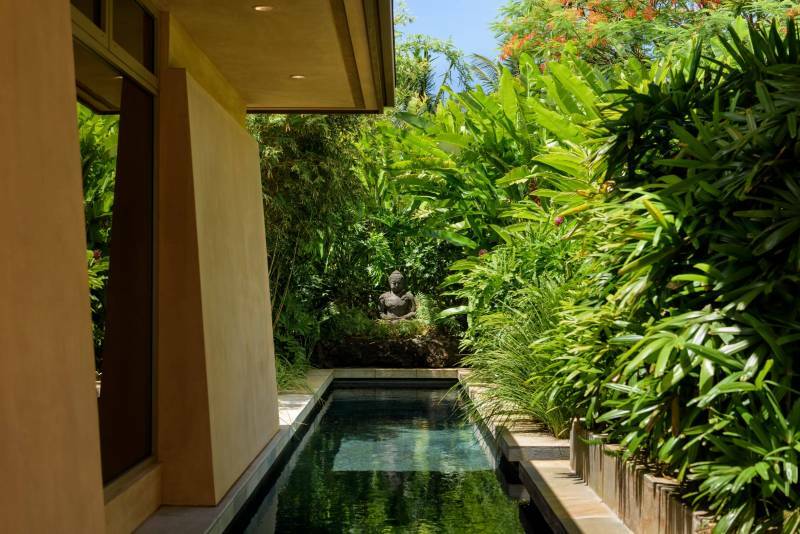 In fact, the sanctuary-like property is so serene that it borders on meditative. 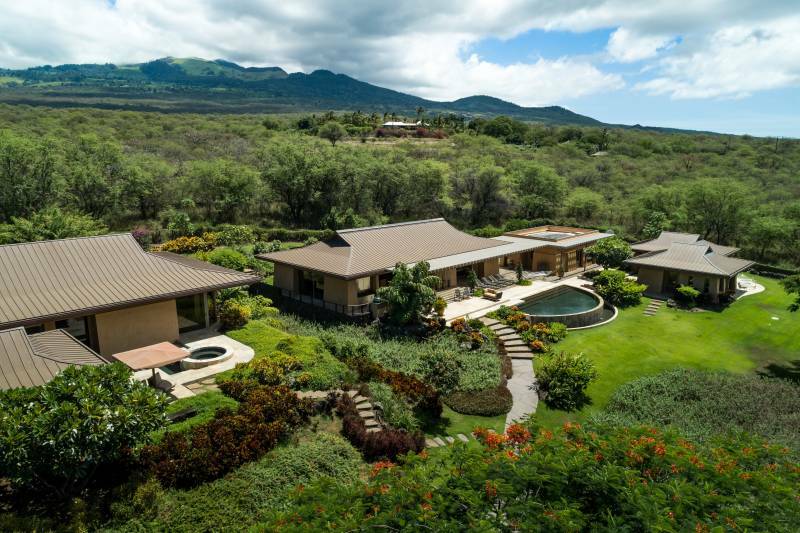 With its meandering stone pathways, arched ipe-wood bridges, lava rock streambeds and outcroppings, and lush landscaping, the two-acre estate is tailor-made for anyone craving some peace and quiet. And nature is everywhere. The luxurious expanse of green lawn is fringed by fruit trees—including mango, strawberry papaya, starfruit, lemon, lime, orange, tangerine, and allspice—a variety of native plants, and eye-catching blooms of bougainvillea, heliconia, plumeria, and birds of paradise. 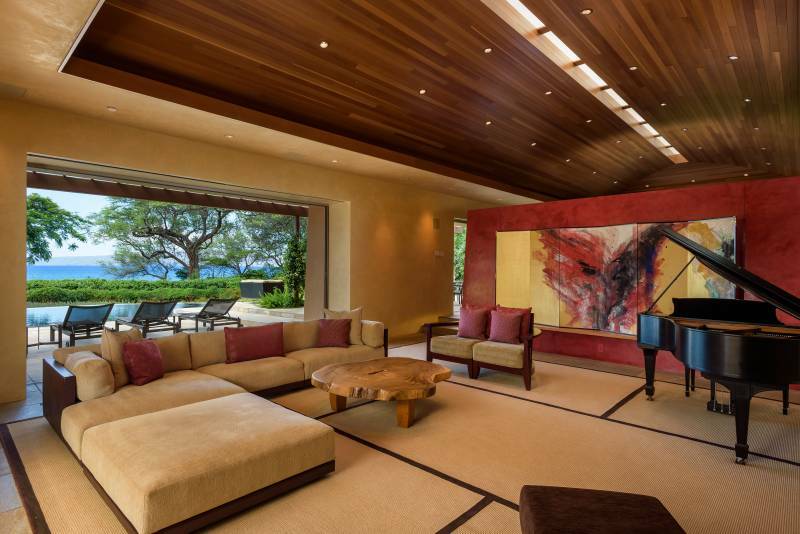 This nearly 6,600-square-foot residence is spread out over seven distinct structures: a generously appointed kitchen, dining and living area, two guest suites, master suite with an adjoining office and gym, theater room, caretaker’s ‘ohana, and a three-car garage. The detached layout fluidly connects the indoor and outdoor spaces, while affording maximum privacy. Indulgent touches throughout, including honed granite countertops, lustrous quartzite floors, scratch-proof laminated cherry wood cabinetry, knot-free cedar ceilings, galvanized Fleetwood sliders, and Italian plaster walls hand-finished with beeswax. On the copper roof, photovoltaic panels power the home—and the compensatory solar net metering system generates more electricity than is used during daylight hours. Built-in 2008 and resurfaced in 2016, the tennis court is quite literally one of a kind: It is the only private court in South Maui that can be fully lit for nighttime use. 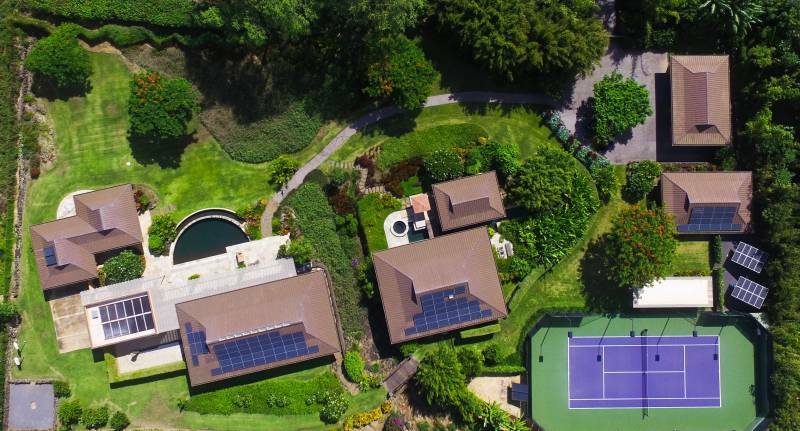 Designed by Royal Lahaina Tennis Ranch owner John Monnier, the court’s dimensions meet the United States Tennis Association’s league and tournament requirements. It is cushioned with eleven layers of sand and has on-court power, eight lights, meshed windscreens, a practice wall, storage area, and a trellis-shaded viewing terrace with a half-bath and wet bar. And given the property’s proximity to Ahihi Bay, the possibilities are seemingly endless: windswept beach walks, impromptu snorkeling sessions, sunset-watching, and stargazing. 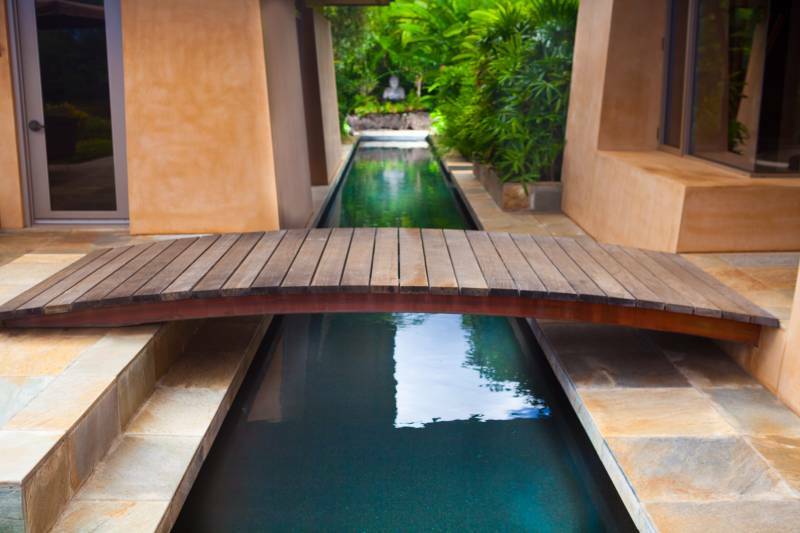 Here, luxury meets tranquility—and it’s a spectacular combination. If you’re interested in 7155 Makena Rd, give me a call or shoot me an email.